How 350.org is using open and iterative approaches when localising a global divestment campaign for Japanese audiences. 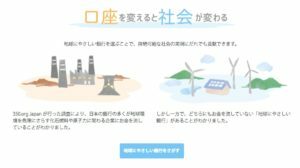 Open and iterative approaches are helping 350.org develop a culturally relevant divestment campaign in Japan–a useful example of localising a global campaign. On the surface, Japan seems to have all the ingredients for successful organising and digital campaigning. It is a longtime democracy with high levels of broadband penetration and newspaper readership. Japan also retains global economic influence. It is the world’s third largest economy and companies like Toyota, Uniglo, Sony and Panasonic are visible global brands. The reality is not so simple. Japan’s activist base is small compared to North America and Europe–campaigning is limited. Government-run funds and banks hold significant shares in dirty energy companies. In fact, Japan is the world’s largest public financier of coal. The country is a crucial piece of 350.org’s global divestment strategy and its goal to keep 90% of all remaining fossil fuels in the ground. A heavy government investment in dirty energy worldwide made bringing 350s divestment work to Japan a priority. For Shin Furuno, Divestment Campaigner at 350 Japan, crafting a fresh campaign with a new, unique, audience presented opportunities to innovate from the start. Initially, Furuno and colleagues looked at engaging an obvious target: college students and universities. Students in the U.S. and Australia were early leaders in divestment campaigns in their countries. But Japanese students proved to be difficult to reach. In fact, one survey found young people in Japan are less concerned about climate change than the elderly, the opposite of what campaigners experience in the West. Moreover, 350 discovered that most Japanese universities don’t invest much, especially compared to their counterparts in the United States. The next obvious target–Japanese pension funds–proved untenable for a very different reason. These funds are some of the largest in the world, and do have fossil fuel holdings. But going after the biggest actor wasn’t considered the best strategy for a new organisation with little name recognition and a small supporter base. “Targeting them first is going to be a difficult campaign,” said Furuno. What was needed was a campaign that could introduce both 350 and divestment to Japanese in a clear way. They settled on a strategy that helped expand divestment campaigns in Australia and Europe to larger populaces: focusing on consumers and personal divestment. “This is something where the hurdle is not as high, and there’s the chance to actually spread the idea of divestment as something everyday people can participate in,” said Furuno. Japan’s high personal savings rate means the impact, if enough people participate, may be significant. Campaigners first identified the banks from which people needed to divest. The second step–designing and framing the campaign–required campaigners invest time in understanding the Japanese social context. Copying and pasting a confrontational campaign from the West into Japan would be a major folly. Change.org experienced this when they entered Japan in 2012. “Aggressive campaigning can be ineffective. You can’t just take stuff from abroad and expect it work in Japan,” said Harris. 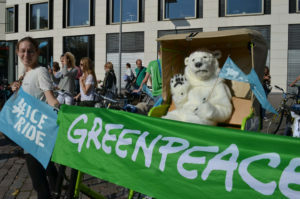 350, however, is known for aggressive campaigning with visible, people-led actions. They’ve stood up to some of the biggest polluters in the United States, Europe, and Australia. In fact, shaming banks and fund managers had been a key facet of personal divestment campaigns in those countries. That’s why 350 Japan initially considered the same approach in Japan. They quickly discovered it wouldn’t work. “When we started talking about fossil fuel companies, the carbon copy of what we’re saying internationally, we quickly realized that singling out a specific company for their negative practices had the opposite effect,” said Furuno. People were turned off. They found arguments against individual companies incredulous, doubting 350’s authority to demean a company that many considered an integral part of Japanese society. Success required a new approach: “Let’s paint the positive picture of where we want to go first, rather than start with the problem,” said Furuno. 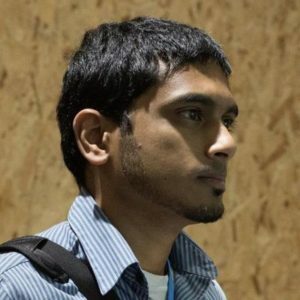 “Not singling out one industry, one company…but talking about the carbon bubble, what it means, and divestment as a solution to changing this destructive flow of money, to a positive flow of money.” That framing was better received. When the campaign launched in January of this year, it had a soft, positive face, focused on collective action. The goal was the same as any of 350’s global divestment campaigns but the message, style, and content were uniquely Japanese. Test and listen. It was only through engagement, discussions, and message testing that 350 Japan was able to realize students were not an ideal target and that a soft, inclusive message would perform better than a confrontational one. Think outside the silo. Most climate-focused groups in Japan are small and work with a niche audience. Focusing on a broader audience allowed 350 to message their campaign beyond these siloed communities and bring climate issues to more people. First impressions matter. In Japan, rushing to launch a campaign just to see what works can backfire, as it can give people a negative impression of the organisation’s image. Testing the campaign allowed 350 to build an image that connects to Japanese values. MyBankMyFuture has only just launched. It will take time for organizers to assess its success. One of the strengths of the 350 open campaigning model is that Furuno and the 350 Japan team have space to alter or re-frame the campaign, just as they had space to test before launch. A screenshot from http://mybankmyfuture.org. The website helps guide Japanese citizens through the bank divestment process. They are well aware that building a campaigning culture in Japan will be a big task. Despite ambitious goals, 350 Japan is starting from a very low point, having just a few thousand total Facebook fans and several hundred subscribers to their email list. “We need to invent a new culture,” said Furuno. ”There is no richness of civic activism in Japan.” Still, he sees hope, as the ongoing Fukushima Daiichi nuclear disaster has put environmental issues at the forefront of people’s minds and led to a wave of activism that had not been seen in the country for decades. 350 Japan plans to build on this beginning, bring in new people, and remain adaptable so it can make divestment happen the Japanese way.